Identifying and tracking impurities before they make it onto the wafer. In the semiconductor industry, “fingerprinting” represents a broad-spectrum material characterization that identifies all the components and contaminants of a material throughout the supply chain. Every product created contains many raw materials and intermediate solutions, and when a final product is completed, each product is unique and complex with its own distinct fingerprint. Figure 1. Fingerprinting within the semiconductor industry. As critical-defect sizes shrink, the defects’ volume fraction decreases exponentially. In many cases, typical Certificate of Analysis (CoA) tests are not sensitive enough to measure defect sources. Even if this level of purity could be measured with tests commonly reported on a CoA, there would be no means of understanding and analyzing the impurities’ composition. Fingerprinting allows identification and tracking of impurities throughout the manufacturing process and the supply chain before they make it onto the wafer. Fingerprinting investigation gives insight into where impurities originate, enabling the material to be understood from the ground up. This knowledge also allows suppliers to use fingerprinting on their own products, to further decrease critical defects at every stage of the manufacturing process and create better products for the end consumer. Continue to use fingerprint data for supply-chain management, excursions, and change management. Figure 2. Fingerprinting implementation steps. As features continue to shrink, they will become even more sensitive to defects and impurities. Existing CoA testing will not be enough to meet the growing need for high-quality products, thus creating a larger market for fingerprinting. 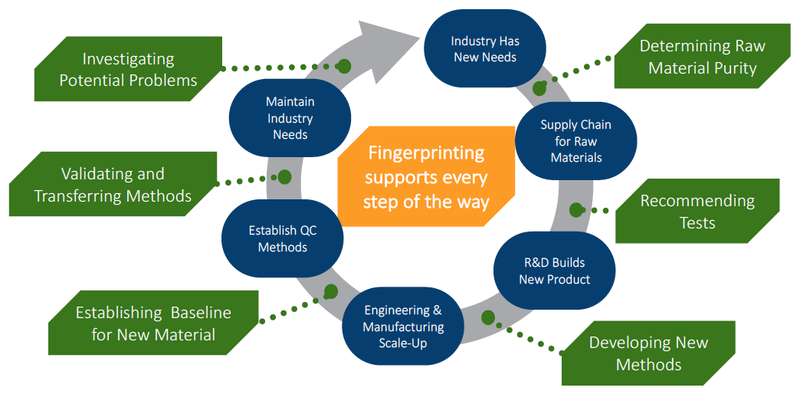 Fingerprinting supports every step of the semiconductor manufacturing industry, in that it determines raw material impurities, helps develop new methods, validates quality products and establishes baselines for new materials. Yongqing Jiang is the Analytical Testing Unit manager at Brewer Science. In this role, she leads the unit’s efforts to characterize all materials and evaluate various processes, ensuring product quality and continuous improvements. She earned her Ph.D. in analytical chemistry from Missouri University of Science & Technology in 2010 and joined Brewer Science in 2012. Yongqing has broad knowledge and extensive experience in analytical chemistry, from environmental bio-analysis to material characterization, especially for semiconductor materials. Her credits include 12 publications, 11 presentations and three patents.